Life is full of set backs and disappointments and if we wait for them to disappear then we will never move beyond them. Unfortunately for most, what’s missing from their success in obtaining their dream is the focus on obstacles. When your focus is on the, why you can’t, then you lose the energy that says ,how can I. As a result you lose ground and opportunities are missed that could bring you closer to your dream. The bottom line dear reader is you just won’t see it. By nature we are driven by support. By support, I mean encouragement and coaching from others. But when it comes to pursuing your dream most of the time you’re the only one who believes in the fact that it can be yours. Listen, it is bad enough when others become obstacles, but it is devastating when you use your current difficulties to seal your fate. Your dream is not determined by your current place in life; it is determined by your “will and passion” to obtain it. This is where your focus needs to be. What have you done, even in the smallest degree, what have you done to pursue your dream? Everything you do should create the energy needed to obtain it which in turn will position you one step closer. Remember there are those who dream because of misery and regret and there are those who dream because of a passion. I trust you are the latter. Life will always present itself with disappointments and difficulties but if you focus on what you desire more, then you position yourself to better overcome these things and in the process become a better person for it. Step back and take an evaluation of your circumstances. In truth they are a part of the journey which disciplines and sharpens our thought process. I think one of the most amazing talents one can possess is the ability to paint. An artist’s world mimics every day life. Think about it for a moment. They start every painting with a new canvas. It’s blank, meaning that anything imagined could be placed on that canvas. They pick up the tools of their trade and then they allow their mind to be free to translate thought into a visual image. The process is a mirror of life. As they stand there in front of that canvas, small strokes begin to lay the frame work as each application becomes the supporting line for the next. Every accent of color brings out the genuine beauty of the objects and all of it created from thought. Can you imagine if the artist were to stand there and think, ‘oh, I can’t paint because of my financial portfolio.’ What if they were to say,’ I better not paint that because no one will like it.’ Or,’ this is too difficult to paint and I’m certainly not good enough.’ Listen, all of us can make excuses for never accomplishing a thing. Everything that is tangible had its beginning with a thought. It was a thought that became a dream and through passion a dream that became reality. As a painter turns thought into beautiful images, so too can your thought give birth to a dream. If you wait for the things around you to change before you dream then your future will remain nothing more than a passing thought. It doesn’t matter what your current means are at this very moment because they can change. What is important is that you have a dream that will launch your future into an amazing journey. If you have that dream, then all you need is the passion to see it through and if you have that my friend then it really doesn’t matter what your current surroundings are. There is a blank canvas there in front of you, now it’s up to you. Your circumstances are but an opportunity to test the level of passion within you that will one day prove itself to all who doubted you, that it was more than a day dream or empty words because you are now holding it in your hands. Remember, where you currently are is just the starting point to where you’re going. It’s just a place. Stay focused on your dream and let passion light you path. Change is going to happen! WANT TO USE THIS ARTICLE IN YOUR WEBSITE OR BLOG? You can, as long as you include this complete statement with it: Author and Dynamic Speaker Dave Dungan has over 30 years in leadership development. Dave’s experience ranges from startups to non profits, consulting to event speaking. Dave’s unique ability to connect with people and truly inspire future leaders is unmatched in todays presentations. His breakout book “Don’t Follow Me I’m The Leader” is taking the businesses world by storm and is paving the way for the future leaders of tomorrow. Sign up for Free success and leadership tips at http://dontfollowmebook.com. 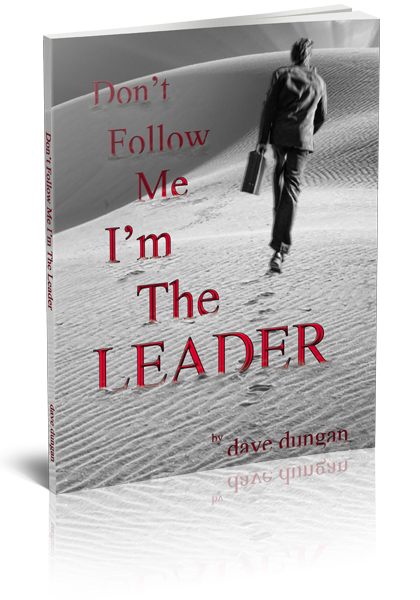 “Don’t Follow Me I’m The Leader” is available at all major online retailers. Author and standout speaker Dave Dungan has a wealth of information and knowledge to share. With over 30 years in leadership development, Dave has honed what it really takes to be a true leader. His passion for people and life change led his to pen his break out success Don’t Follow Me I’m The Leader which has amassed 20,000 plus sales in just a short amount of time. Word is getting out and spreading that this book is not just a book, it’s an experience. Dave’s ability to transform the book in to presentations have led him to stages across the country speaking in crowds of thousands to small classrooms of just a handful. The end goal for Dave is to create relationships with people though his messages that help change and develop readers and listeners to their full and deserved potential.